Researcher Ellen Ogez was preparing a publication on the hiding of Jewish children in Kortenberg in 2017. The book is forthcoming. From Autumn 1942 until September 1944 the catholic sisters who led the Pensionnat des Religieuses Servantes de Marie in Erps-Kwerps, today part of Kortenberg, hid multiple Jewish girls among their catholic pupils. Although the names of most children hidden there remain unknown, three of the girls were identified as the Goldberg sisters. Marie Goldberg was born in Brussels on 29 March 1929 as the daughter of Israel Goldberg (born on 21 March 1908 in Radom, Poland) and Rajzla Abramowicz (born on 23 March 1909 in Czestochowa, Poland). Middle child Sara was born in Brussels on 24 December 1930 and youngest sister Louise on 26 April 1938. In September 1942 all three siblings were placed in hiding at the boarding school by the Jewish Defence Committee. At the institute they were known as Marie, Suzanne and Lea Govaerts. While visiting her parents in December 1943 Sara, Israel and Rajzla were arrested. Sara and her mother survived deportation from the Dossin barracks to Auschwitz-Birkenau via Transport XXIII on 15 January 1944. Israel Goldberg perished. The other girls hidden at the Pensionnat presumably all survived the war. Among them were Vera Abel (hidden as Véronique Abeele), Hélène Majster (hidden as Hélène Dubois) and Suzanne Bleifelder. 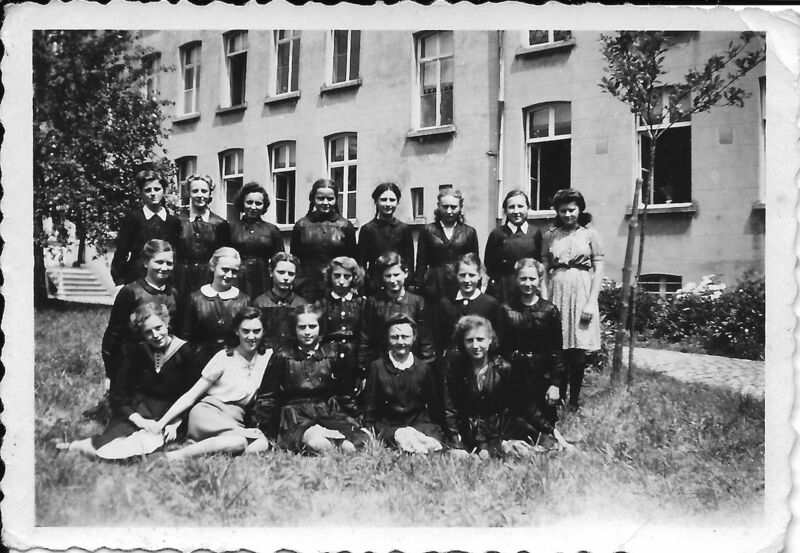 Ellen Ogez, member of historical working group HistoKa'44 in Kampenhout, found these photos during her book project on Jewish girls hidden in 1942-1944 at the boarding school of the Religious Servants of Mary in Erps-Kwerps.